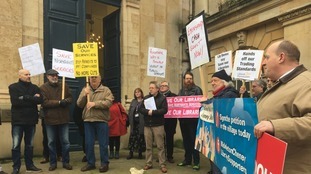 Northamptonshire County Council faces "severe financial challenge"
Northamptonshire County Council has been forced to impose emergency spending controls after warning that it faces a "severe financial challenge". A commissioner may be sent to supervise Northamptonshire children's services after a critical Ofsted report. Education leaders representing around 200 schools have written an open letter to the county council rejecting its 'Stabilisation Plan'. Following an extraordinary meeting to discuss its funding crisis, Northamptonshire County Council has set out where it's planning to make even deeper budget cuts. Even core services like child social care won't escape unscathed. The failed authority has been heavily criticised for not being clear on how exactly it plans to meet even the most basic of its obligations. And after last night's meeting, many say they're as confused as ever as to how the problem will be dealt with. Last night councillors held an extraordinary meeting to discuss how to tackle the funding crisis, and what services they can realistically deliver. Experts have said the situation is unprecedented - just last week spending controls were imposed for the second time this year. The cash-strapped authority says the sale and leaseback agreement will help fund the transformation of its services. Council leaders in Northamptonshire are today preparing a response to a damning Government report into their finances. The Inspection team believe a “new start” is required for the residents of Northamptonshire. There are fresh calls tonight for mass resignations at cash strapped Northamptonshire council as the financial crisis starts putting public services at risk. The Council has already banned almost all new spending and agreed to sell off its recently built headquarters. The authority is looking to cut around 30 million pounds from next year's budget, but today's vote on the spending plan had to be postponed after auditors said the sums didn't add up. Auditors have ordered Northamptonshire County Council not to set its budget this week - because it could be illegal. Northamptonshire County Council will sell the multimillion pound headquarters it moved into in October.